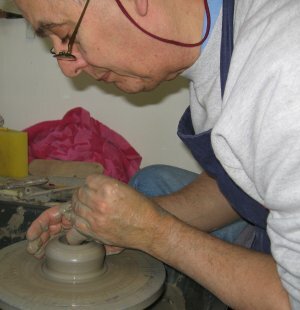 I had my first experience with clay on a wet day in Cornwall, when I was introduced to the wheel by Michael Truscott, who had been trained by Bernard Leech at his world-famous St Ives Pottery. Some years later I rediscovered clay at the Sir John Cass School of Art, at Whitechapel, London, where I worked with Beryl Harman. Boyd Parker and Sarah Perry, who both taught at Elmwood Pottery in South London, were major influences on my development. Sarah, who now works in Greenwich, is still an inspiration to me. Later I set up my own Pottery in Brentford and taught at The Lambeth Institute. I was invited to contribute to two exhibitions at the prestigious Dulwich Picture Gallery alongside Lucie Rie and other well established Potters. In 1986 I gave up teaching and returned to my roots, setting up a West End Theatrical Agency. 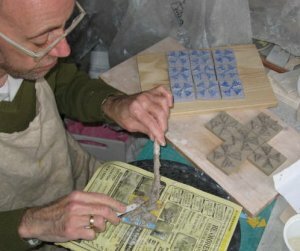 I retired from the Agency in November 2007 and since then have been establishing my Pottery in Wendover with Godfrey Thorpe. The Wheel started to turn again on January 1st 2008! I work in high fired stoneware, to a maturing temperature of 1280°C. Natural forms and landscapes influence my work. I enjoy both hand building techniques and wheel throwing. My creations rely principally on shape, form and glaze-effects for the finished piece. After spending a working career in Television, facilitating the commissioning, scheduling and production of programmes, I have turned my hand to being creative myself. Fascinated by symmetry and optical illusions, I am developing a style of tiles incorporating a form of Op Art motives and patterns, derived from natural and historical sources. I have been working in clay since the beginning of 2008 and at first worked with Terracotta which is fired to 1120°C, although I am now using and exploring the capabilities of using High Fired Stoneware Clay. I'm particularly interested in exploring the effect of light and shadows in 3D pieces - some of which are shown on this website. We're both members of the Bucks Visual Images Group, organisers of the Buckinghamshire Open Studios season which takes place each June. We invite you to contact us to find out how VIG can help you in your artistic career!